This comes as quite a shock to me, even as i type it, i have visited 25 countries but I never made it to Hocking Hills State Park which is only a three hour drive from my home. About this time last year, my family and i took a long weekend style trip to West Virginia, including Blackwater Falls State Park and the Snowshoe area. So this year when my son asked if we were going to go somewhere to stay “in a little cabin in the woods” we started looking around. 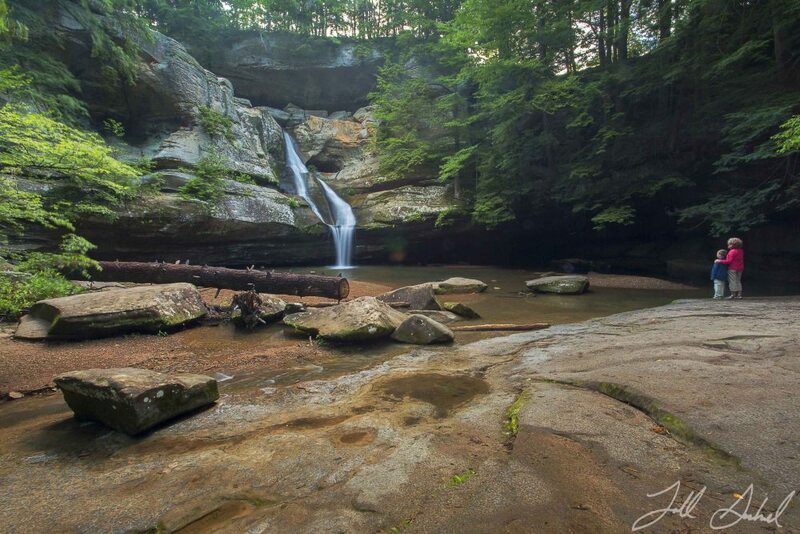 Our schedules didn’t allow us to travel too far, so after considering many options we eventually decided on a three day road trip to Hocking Hills State Park. So we loaded up the family truckster and headed down to Logan, Ohio to our little cabin in the woods. The weather forecast wasn’t very favorable for the weekend so we decided to get an early start on Friday morning, making the quick three hour drive down, arriving just a little after lunch time. 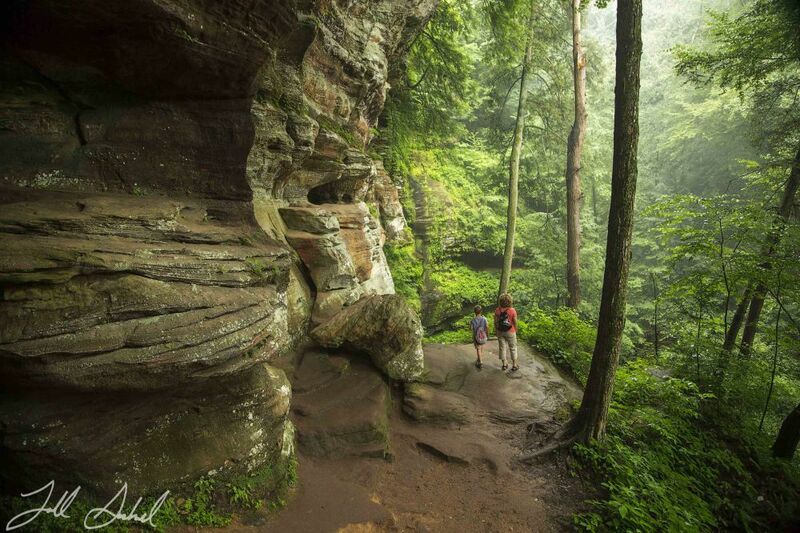 We checked into our cabin, dropped off some of our gear, and headed straight for Old Man’s Cave. The first thing that grabbed me was scale of everything……absolutely impressive. We quickly worked our way through the major features of this area (Upper & Lower falls, Devil’s Bathtub, etc) exploring as much as you can safely with a 7 year old “hiker” in tow! As expected i was snapping pictures like a machine gun the whole time, since this was my first visit I wanted to focus on the size and scale of things by capturing my wife and son in context in the landscapes. Just as we were walking out of the trails the rain began to fall. Frankly, it was perfect timing….we were already thinking about dinner! One side note that i want to mention, this turned out to be a real “getaway” because neither of us had a cell signal anywhere within a 15 minute drive of our cabin!! So we truly were unplugged for 12 or so hours per day…..it was scary and liberating all at the same. We headed for Logan to try and find Pizza Crossing, which we had researched ahead of time and read many favorable reviews. We placed a carry out order to take back to our cabin, and then sat in my vehicle in the pouring rain while we waiting, enjoying the rare moment of connectivity catching up on what had transpired during our adventures. We took our pizzas, which were fantastic by the way, back to our cabin and enjoyed them with a hiking sized hunger…..followed by some heavily contested family battles of UNO!! The weather for the following morning did not pan out for sunrise images, but i decided to head out and scout some locations while it was still raining. Mid-morning the weather was beginning to break so i headed back to check in on the rest of my crew. We decided to start off at the Rockhouse, since it was very close to our cabin. This turned out to be one of the best surprises of the trip, we had heard about all of the well publicized falls, etc. but this became an instant favorite. All of the wet weather and humidity created an almost magical atmosphere resembling a fairy tale forest, the lush green foliage was amazing!! This turned out to be a tough act to follow. We headed to Cedar Falls finding one of the very last parking spaces, we sat down and enjoyed a picnic lunch among the throngs of people. Afterwards we ventured down the trail in amongst almost a parade of people, we decided that this wasn’t the vibe we were looking for. We tried Ash Cave and it was more of the same, I’m pretty sure that they were evening having a wedding there. We vowed to get up early the next morning, and decided to cut our losses and head back to the cabin for a little downtime before heading out for dinner. We had passed Millstone BBQ in our travels and decided to give it a try. It was Saturday at 7pm and the place was packed, but following our own rules of travel (we would rather have the last seat in a crowded restaurant…..than the best seat in an empty restaurant) we opted to stick around for the 30 minute wait. It was well worth the wait, lively atmosphere coming with wonderful southern barbecue. We stuck to our word about trying to get an early start in efforts to avoid the crowds and we on the road a little after 7am. This turned out to be a great decision, as we descended on Cedar Falls there was only one other family quietly enjoying the tranquility….a start contrast from the previous afternoon! Then we decided to head Ash Cave before the crowds arrived. This has to be one of the coolest places I have seen, the sheer scale of this cave is just amazing!! Ash Cave was hands down was my son’s favorite spot of the entire trip. He was running all around beneath the falls, and as any boy would he asked: “can i just stick my hand in?” We all know how this ended!!! No worries, since we were heading back to the cabin to check out, find something to eat, and then head home. We finished off our trip with a wonderful late breakfast/ early lunch at M&M’s Family Diner. Do yourself a favor, skip Bob Evans, drive another mile or two into Logan and check this place out. Awesome home cooked comfort food, amazing friendly people, and there is a ton to look at…….covered in photographs, paintings, not to mention the Ohio State shrine. They even have a stack of toys for kids to play with while waiting for their meal. The food reminded both my wife and i of those fond memories of your grandmas cooking…..before we cared about calories or what a carb was!! 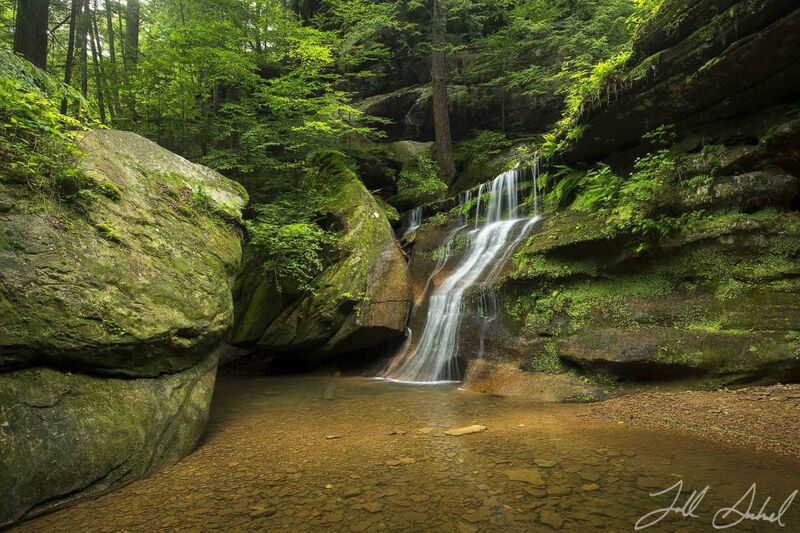 I have no idea how it took me this long to visit Hocking Hills for the first time, but it won’t be long until my second! !